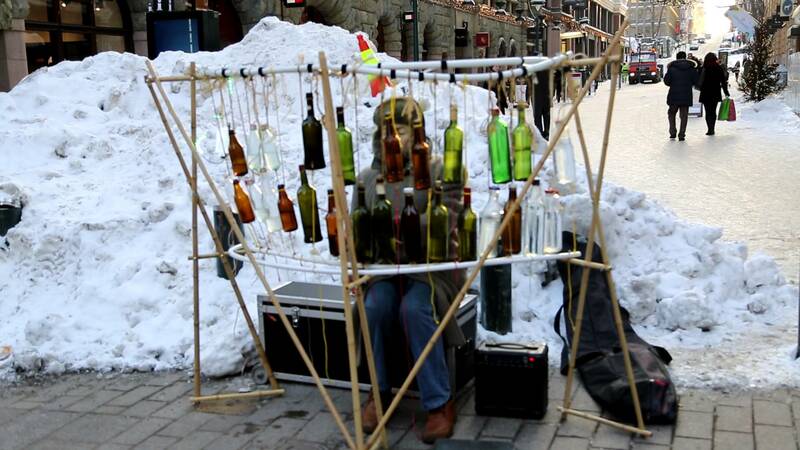 In rain, sunshine or snow, the chances are you will see him with his glass bottle xylophone in the center of Helsinki. With his sailor cap on, he will be sitting in a corner playing Tchaikovsky. 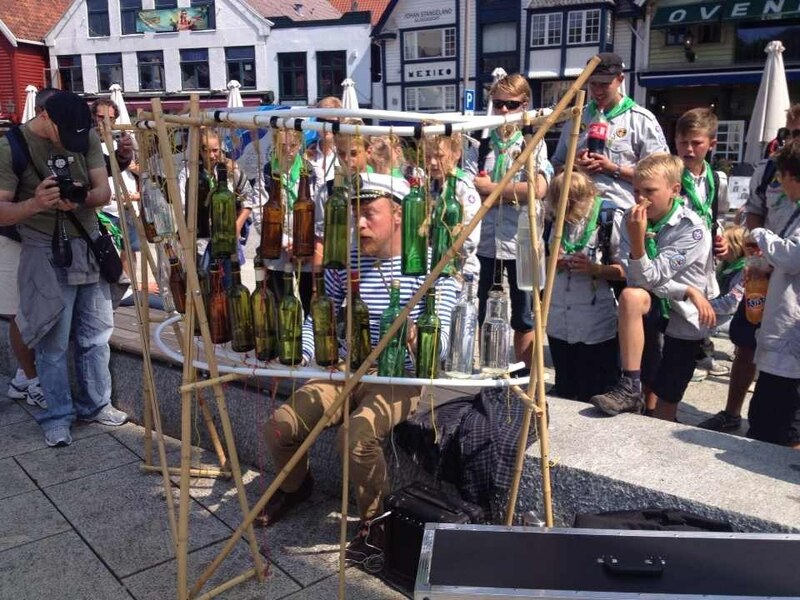 There will be an attentive crowd gathered quietly around him, marveled by the acoustic sound of the water bottles and the musical mastery of this unique street performer. 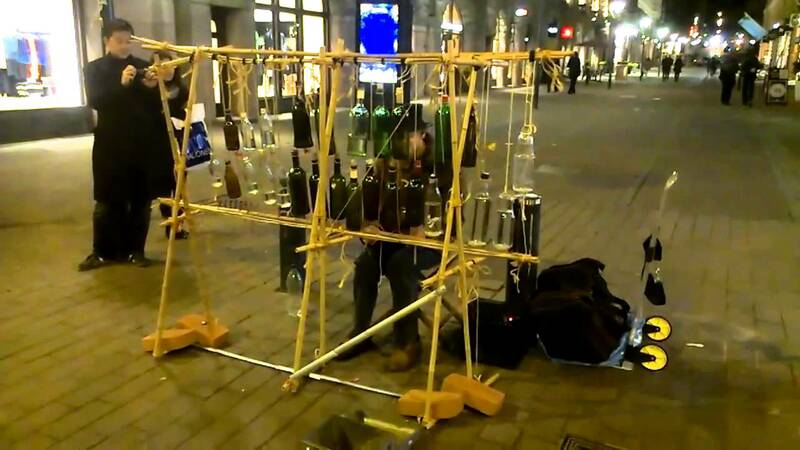 He is a trained percussionist for whom street art is his job. For fourteen years the Helsinki corners in front of Stockmann and Kluuvikatu have been his workplace. I meet Feodor Grigorev one summer evening over tea with my German friend Christina Reck, who kindly ensures the conversation flows in a mixture of German peppered with English. Feodor’s native tongue, you see, is music and Russian follows thereafter. German comes next in line. I am unfortunately not fluent in either of these languages. Tell me how you became a street musician? In 1989 there was a Theater Street Festival in St. Petersburg. The Festival extended to other cities in Europe. My brothers and I decided to participate performing French Comedy. I have 4 brothers and 2 sisters and I am the eldest. We had never played in a street festival before, but we did and we enjoyed it. We followed to Moscow. At the time I was a music student, specializing in percussions. The following summer we did it again and in 1991 we went to Germany to perform abroad for the first time for 50 days in several cities. My mother came as well to look after my younger brothers. My mother was a pianist when she was young and she loves music too. Two of my brothers play the accordion, one plays the trumpet and one of them is also a percussionist like me. 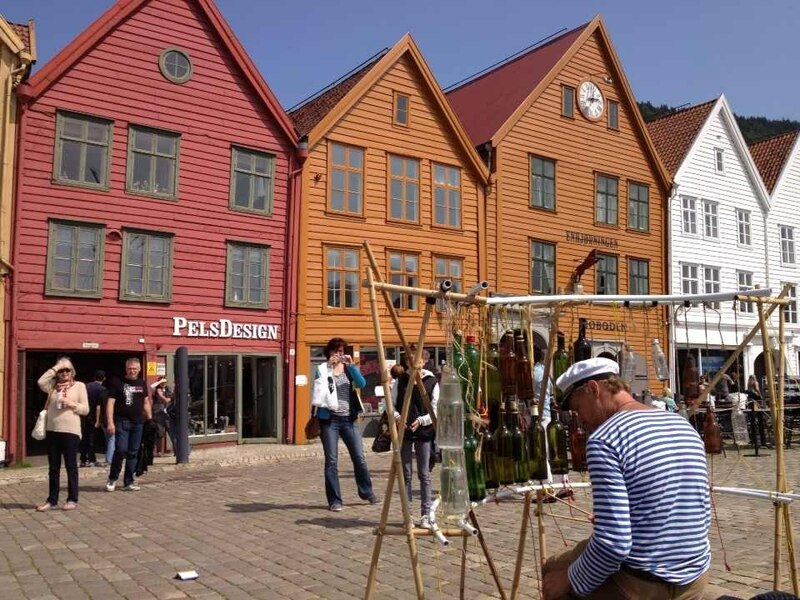 To this date, one of my brothers, the accordion player, works in Copenhagen as a street performer as well as an organist in a church. It was in those years that we cut the bug for street performing. And you have done this ever since? In 1993 and for a few years, I took a job as a rock musician. I also was an assistant camera man and worked in a small theater as a clown. 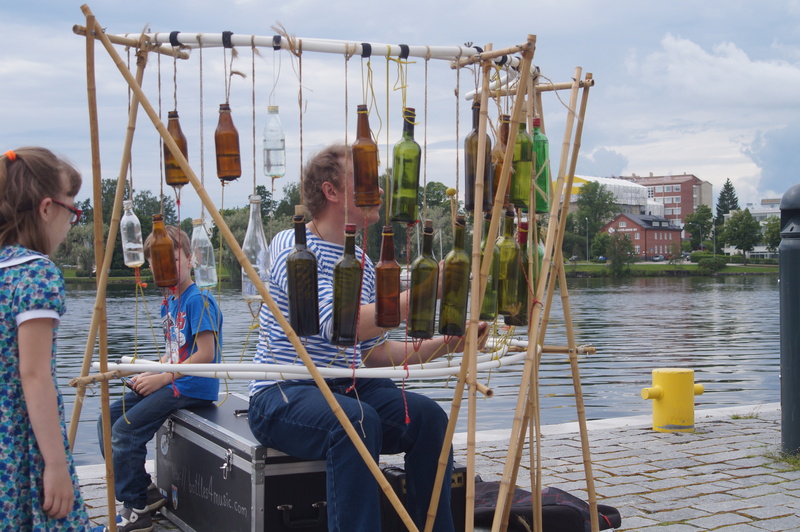 But in 1999 I decided to become a street performer and I came to Helsinki for the first time to perform. 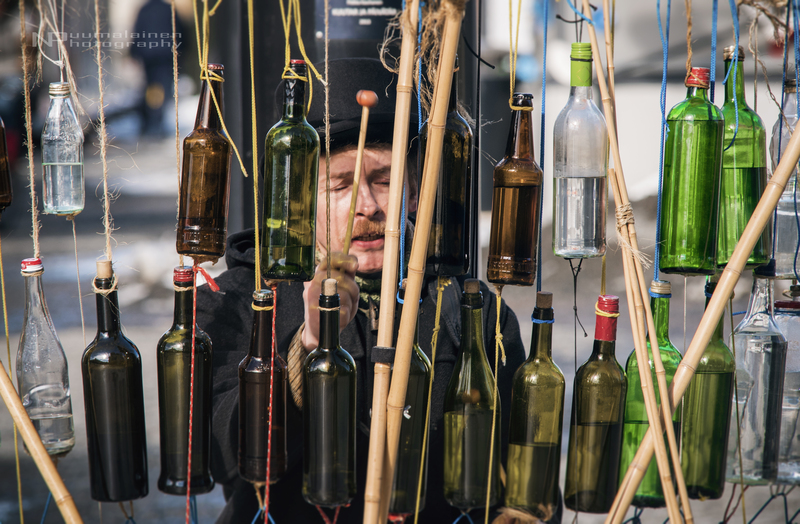 What is it about street performance that you enjoy so much? I have a lot of freedom as a street musician. I can start work when suitable. If things are going well and I feel like playing longer than planned I can also do that. But most important, I do what I love, which is play music. This allows me to connect with people, to touch them. I can’t actually imagine a better job! 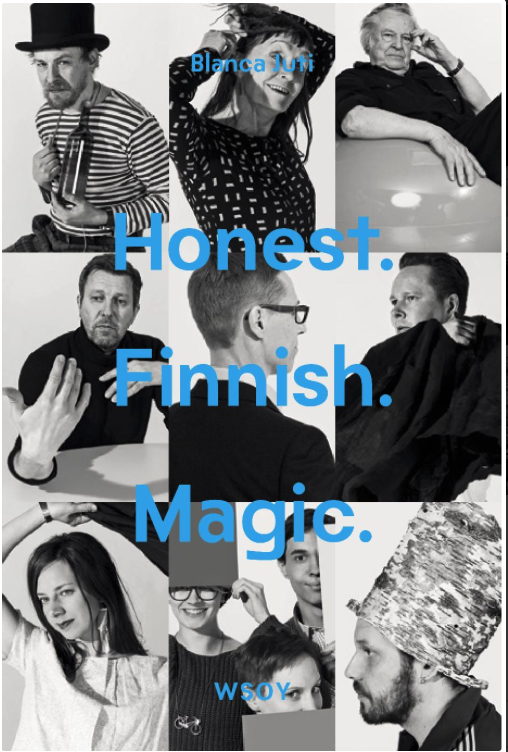 How many days a year are you in Helsinki? Some 100 to 160 days. I live in St. Petesburg with my wife and my three year old. But I am very often in Helsinki. When in Finland I live in a hostel for musicians. I have three favorite spots in Aleksanterinkatu. 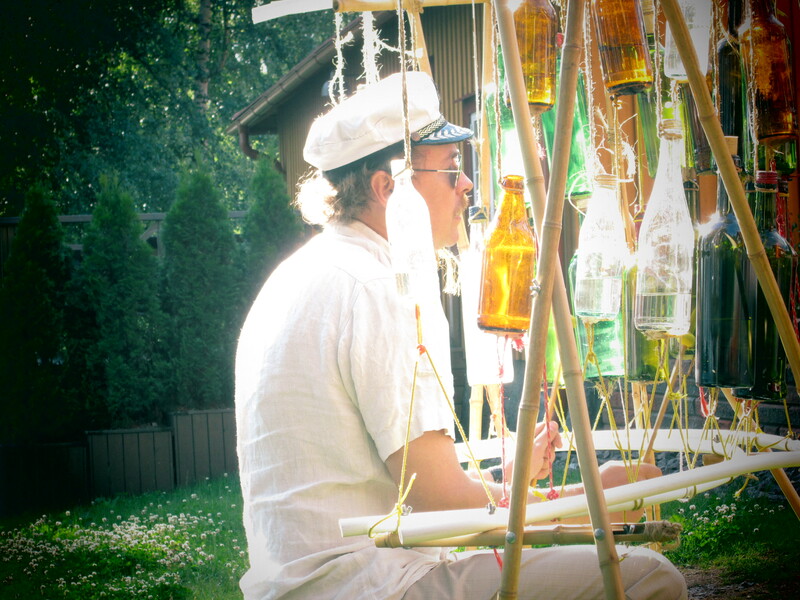 I come in the morning at around 10 or 11 am with my bottles (they are pre-filled) and the structure I made for the xylophone, which is made of bamboo. I play for 6 hours in one sitting, maybe a bit less in winter, some 4 hours per sitting. In winter I have to add an alcohol de-freezer to the water and I will play with up to -15 degrees centigrade! Do you play faster music in winter to keep you warm? I play all kinds of music, fast and a bit slower. But the xylophone is quite a quick instrument! Yes. I have studied music and practice a lot. But I also like my street conservatory! Do you have notes with you? No I play from memory. I play mainly all the classics. Sibelius is not suited to the xylophone. Sibelius needs to be played more slowly. If I played the trumpet I would definitely play him! What do you like about playing in Finland? In other countries people want to ask me a lot of questions. In Finland people listen to me in peace. They let me play. I like that a lot. Yes people here treat me very well in Helsinki and are generous. Some people return to listen a few times and I begin to recognize them. One man in particular, often comes back and asks me for his favorite piece. What is the best moment of your job? The best moment is when I play a totally new piece and I am trying it out. If I notice people stop and like it that feels really good! I like very much when people stop from their day to day routines to listen for a few moments. Conversely it is difficult when people simply pass by untouched by the music. One moment that also feels very good is when I return home to St. Petersburg after a few days of good work. Do you know the other musicians or other street performers? Yes I do. 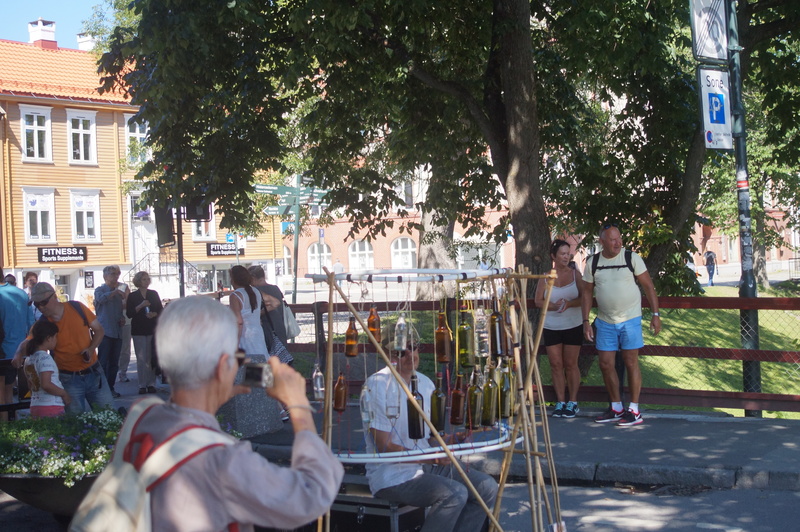 A few years ago there used to be many street musicians from Russia in Finland. We all knew each other. Now there is only 5 of us. Maybe there is more money in Russia today and people feel less need to go out. In general we know each other and help each other out, say when one of us needs to go to the toilet and needs a friend to look after his instrument. Or we offer each other tea. 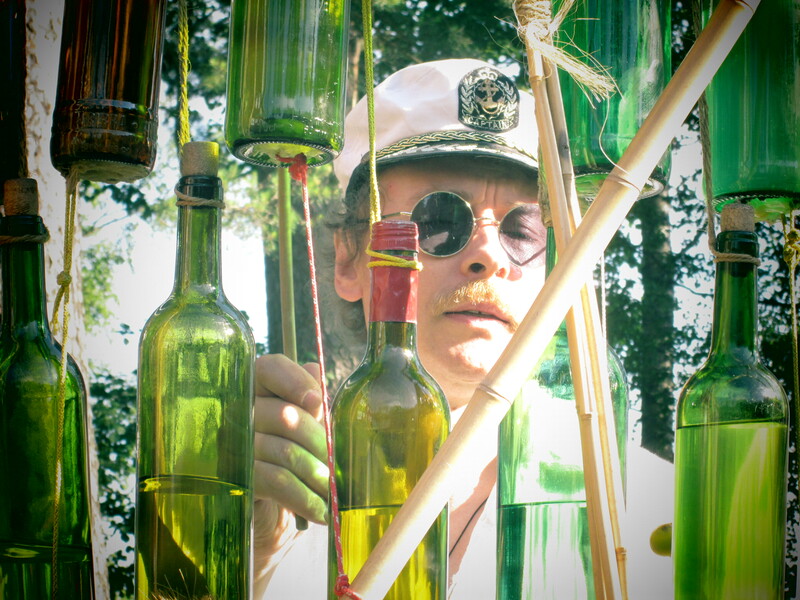 How did you come up with the idea of the water bottles xylophone? I have played different instruments in the street. I used to play a marimba. A friend of mine challenged me with the idea of making a water bottle xylophone. I researched it in Youtube and found a couple of other musicians who had one, one in Zagreb and one in Vienna. I then made my own. I chose bamboo for the frame because it is both light and strong. I love the melodies of Fritz Kreisler. I am sometimes not aware how very happy I am but when I look back at my memories, they are just wonderful. This summer my wife, my son and I will go to the Black Sea for three weeks. I also relax with a bottle of wine at home. If you were an instrument what would you be? A grand piano in a beautiful large apartment! The first instrument I learnt to play was the piano. Do you live by a life motto? Whether you feel good or not good, it’s all in your mind! "Музыка, извлекаемая из вчерашнего праздника"
Фёдор Григорьев© 2013 Все права защищены.